Brussels. Framed by gigantic sheets of blue plate glass, Roma are rattling change in old tin cans. One tries to sing, another limps on a metallic crutch, but they are hurried along. The curved glass sheets of the Commission building catch the light; not transparent but reflex tinted – leaving the EU symbolically opaque. They call this area Charlemagne, after the first Holy Roman Emperor, uniter of France and Germany. Underneath, there are metro tunnels; during working hours, they are filled with bureaucrats, many rolling a suitcase right off the Eurostar. Outside EU working hours, the majority of passengers are either Turkish or Congolese. There are no effective ticket barriers. Nobody bothers with fares. Cheerful music tinkers over the dingy platforms, and you start remembering scenes from A Clockwork Orange. Maintenance has been hit or miss it seems since the 1970s. 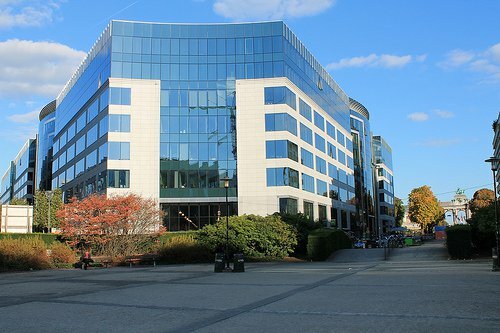 Entering the HQ of the EEAS (the European External Action Service) – the diplomatic corps of the twenty-seven, soon to be twenty-eight, members of the EU – is to step into one of these fishbowls of power. Unlike the roundabout outside, here, monastic quiet reigns. The HQ is built around a circular courtyard, and dotted along the glass walkway are posters signalling the EU’s diplomatic achievements: grateful Palestinians smiling at a eurocrat; happy African leaders posing with the outgoing chief of the EEAS – Baroness Catherine Ashton, a former chair of Hertfordshire Health Authority. Eurocrats have not marshalled Europe’s massive resources. The EEAS was founded with a mission – to give Europe’s diplomats the influence that should come from a geopolitical area with a GDP larger than both China and the USA. But for all that wealth, Brussels has proved less than equal to the might of Washington; and the EEAS no match for the State Department. The eurocrats have disappointed despite their massive resources. Europe has the second biggest defence budget after the Americans, and is the planet’s number one aid donor. Neither is there any shortage of diplomats: Europe as a whole has no less than 57,000 of them; India has a mere 600 diplomats. Europe so wants to be powerful diplomatically. This is why the EEAS had money thrown its way – over £500m for 2013. This sounds like a lot, but it is still less than North London’s Camden council. They say the way of working out how useful an organisation is, involves imagining what would happen if it did not exist. I think about this in the EEAS lift. Obliterating Camden council would certainly reduce North London to anarchy – unburied dead, collapsing schools, imploding hospitals and un-policed streets. But, as the scratched metal doors open at the 3rd floor, I am unsure what really would be different without the EEAS. The shortage of eurocratic influence is especially keenly felt in Russia. Which is why the EEAS is doing everything it can to work out what is going wrong: with policy sessions, discussions, briefings and expert seminars. They have even invited me. The seminar with the Brussels’ diplomatic corps takes place in room DL752, only I can’t find it. Pacing around and around the round corridors I look for somebody to ask, but there is nobody. The numberless curved cubicles are all empty, and they all have the same map of the EU-27. Downstairs, there were lots of people milling around. Upstairs is so quiet you can hear the humming of hundreds of hard drives. At last, I spot an immaculate, grey, eurocrat. He seems annoyed at this interruption – shakes his head and fingers the gold cufflink on his shirtsleeve. “Ask my secretary,” he grunts. He is Austrian, or maybe Hungarian. I don’t know. Room DL752 is empty when I arrive. Talking to EU diplomats is surprisingly emotional.... Eurocrats adopt a disappointed tone of voice [about Russia], like a stepfather lamenting the failings of a potentially gifted, and yet errant, adopted daughter. The EU sees the world through these cubicles and conference rooms. And this is the floor it uses to see Russia; a country the eurocrats find rather annoying. Firstly, Russia is always blocking the ‘good’ things that the EU would like to do – Georgia, Ukraine, Syria…. Secondly, Russia makes the eurocrats feel particularly helpless when it thinks of the organisations that it would like to help, and can’t – embattled NGOs and the liberal opposition. Thirdly, Russia unsettles the eurocrats when they think of the sinews of Putinist corruption spreading cancer-like into the EU; and then there is all that Russian cash they apparently find so hard to resist. Talking to EU diplomats is surprisingly emotional. This is because Russia is often talked about as if it is a person. When talking about Russia, eurocrats adopt a disappointed tone of voice, like a stepfather lamenting the failings of a potentially gifted, and yet errant, adopted daughter. Within the EU, Russia is a long-standing family disappointment. Russia brings up exhaustion and offence. It is not part of the new exotica, like the “China challenge,” or the tantalizing quagmires of the Middle East. 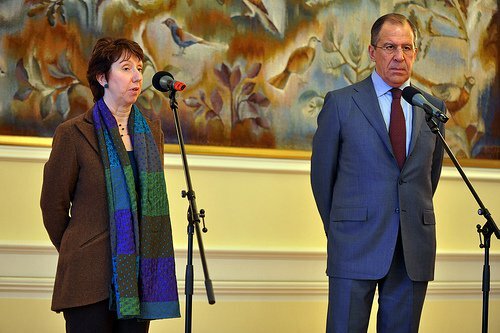 With Russia there is enough intimacy to breed exasperation, even resentment. The EEAS endlessly discusses its own impotence – its inability to interfere, influence, or impact Russian domestic politics. The EU is not a state; and the EEAS is not the European equivalent of the US State Department. Policies have to be agreed by the twenty-seven member states before they can get involved. Eurocrats have many masters: “But Spain would say no; but Germany would veto.” This effectively cuts out any possibility for radical action. EEAS officials repeat a mantra — despite the trappings of a foreign ministry, they are not one. Nevertheless, perhaps the EU is wrong to be so self-critical; why is that? Because one of the lessons of the fading Moscow protest movement is that the general EU posture towards Russia seemed to be working. The big vision – dating back to the 1990s, and adopted almost by default – went something like this: make it easy for Russians to travel to the EU, promote trade, engagement, dialogue and access wherever you can; and hope that over time a new Russian middle class emerges that demands Russia look more like the Europe they have come to know as tourists. The smaller vision was to invest in civil society – scatter political seed capital, and fund the training and development of NGOs, invested with the aim of building the institutions Russia needs to be more like Europe, such as election monitoring, human rights, civil society; and then, wait. The Moscow protest movement may have fizzled out, but what it symbolised has not. Never had so many Russians been more European. In many ways, Russian society has proved that the long wait was worth it. The Moscow protest movement may have fizzled out, but what it symbolised has not. There are now millions of Russians who want to have a say in their society. The NGOs the Eurocrats were supporting – like the election monitors at GOLOS – suddenly found that there were Russians willing to join them. In short, never had so many Russians been more European. In room DL752 the policy session is nearing lunch. Eurocrats glance at watches or flick open their phones. This is how policies are made: low-level discussion, and lessons learnt one at a time. I am giving a power point presentation on the need to respond to Mr Putin’s crackdown, with more human rights activism. There is disquiet in Brussels that the old model of simply engaging with Russia – sponsoring NGOs, and trading in the hope that reform will follow – is no longer working. Engagement seems to have become counter-productive. Sponsoring NGOs has now been effectively outlawed in Russia, with the “Foreign Agents” law that imposes heavy fines, and demands paralysing paperwork from any body accepting EU funds. Trade, as an engine of reform, also seems to be an open question: a burgeoning business class might be increasingly loath to challenge Putin. The EEAS is aware of this, but it is not their most serious dilemma, which is that the moral authority of the EU is slipping. Russian power is increasingly undermining the integrity of European institutions, exposing them to the charge of moral weakness. When EU officials dismiss corruption in the once hallowed halls of the Council of Europe, as not as being an issue of the first rank, they are wrong. Europe’s power over Russia through the centuries has rested on the foundations of democracy and the ideals of material and social progress. If it were to lose that then the EU would really begin to taste irrelevance. Europe is doing nothing to fight a growing impression in Russia – a view shared by opposition leader Alexey Navalny – that Europe is feigning outrage about Russia’s failings, when, in fact, it is keen to do nothing to stop trillions of stolen roubles continuing to flood the continent. Russians too should be worried, about Europe losing its appetite for thinking Russia is deserving of all this effort at promoting reform. Russian elites are quick to snap about being “lectured” by Brussels, yet they would be mistaken in assuming that Europe’s commitment to Russian civil society is guaranteed forevermore.